Townhouses with great open floor plans, spacious living, kitchen and dining that opens to a deck. Best of all, the Winter Shuttle picks you up in front of your unit and you'll be at the Base Lodge in just a few minutes. Nestled in a wooded setting just one mile from the bottom of the Access Road, these units perfectly accommodate your weekend guests. Intervale has long been a popular mountain community and these units offer a warm and inviting ambiance in a great location. Enjoy your winter days on the trails and come home to your Vermont home in Intervale. Stratton Sports Center Bond eligible. This stylish and newly renovated townhouse boasts an end unit (with extra large window) and 4 bedrooms and 3 full baths. Intervale Condos are situated in a mountain setting among ponds and woods yet right off the Stratton Mounatain Rd. A bubbling stream outside the door creates a lovely country feeling! The open great room with vaulted ceiling and wood burning fireplace offers apres ski ambiance with kitchen and dining areas open for entertaining and large family gatherings. The new kitchen has been tastefully updated with granite counters, stainless appliances and custom cream colored cabinets. A huge picture window over the sink offers sunshine and natural light. The spacious loft has been strategically enclosed adding a private twin room(approved egress added ). The master bedroom en suite is conveniently located on the first floor. All the bedding is lovely with down comforters and Garnet Hill German flannel sheeting atop high quality mattresses. Just minutes to Stratton Village and the base lodge via private shuttle that runs Holiday weeks and Weekends to the slopes..LUXURIOUS AND UPSCALE DECOR! This home has been meticulously maintained with tasteful country furnishings and very comfortable warm and inviting decor! The owner is a licensed broker in Vermont. The Stratton Fitness Center bond is available with transfer fee paid by the Purchaser. Come and see how this Intervale town home rivals any newly built condo on Stratton in style and amenities! 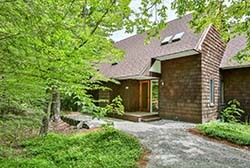 I have a question about the property at 22 Maple Beech Winhall VT 05340 (#4695128). I would like to schedule a visit for the property at 22 Maple Beech Winhall VT 05340 (#4695128). Intervale at Stratton is convenience in the Country! Easy drive or shuttle service to Stratton Resort. First Town Homes up the Access road to resort. Three generous bedrooms with living room fireplace. Deck for summer entertaining and extra loft space for sleeping or TV. I have a question about the property at 34 Nuthatch Road Winhall VT 05340 (#4714843). I would like to schedule a visit for the property at 34 Nuthatch Road Winhall VT 05340 (#4714843). I have a question about the property at 38 Pond View Winhall VT 05340 (#4615969). I would like to schedule a visit for the property at 38 Pond View Winhall VT 05340 (#4615969).